This salsa is a perfect end to summer, as it captures and showcases a ton of classic summer flavors. 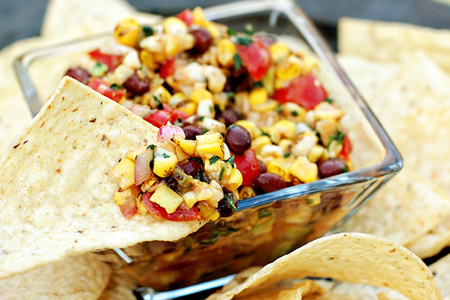 You have sweet roasted corn, tomatoes, roasted peppers, onion, avocado and lime along with black beans and cilantro. Who doesn't like sweet corn roasted on the grill? That's a serious meal, yes, meal, in our house this time of year. I remember going on long corn-hunting expeditions with my grandfather along the country roads of central Missouri as a kid. We'd stop at almost every mom-and-pop roadside corn stand that we ran across. To this day I remember how he taught me to identify the good corn from the bad. He'd tell me to look for smallish rounded (not square) kernels that weren't too yellow, or, better yet, a mix of yellow and white. He told me to look for medium-sized ears where the juice would easily squirt out when you pressed your thumbnail into the kernels. The harder you had to press in the raw meant that you'd have chew that much harder later. I use that advice to this day and, while the people at the farmer's market and in the store often think I'm crazy, his advice has held true. Friends don't let friends buy bad corn. The part that I can't believe is that grilled corn is relatively new to our family. How is is that you can grow up in a grilling family and only eat boiled corn?! It just ain't right. Let the record show that I've done my best to correct this clear travesty. I think my kids have had boiled sweet corn about three times. OK, I'm rambling, let's make some salsa! 3 Roma tomatoes, seeded and diced to 1/4"
3 Jalepenos, fire-roasted, seeded, and diced to 1/4"
2 medium Avocados (just shy of ripe), diced to 1/4"
1 Red bell pepper, fire-roasted, seeded, and diced to 1/4"
1 medium Red onion, diced to 1/4"
In a large mixing bowl, cut the corn off of the cob. Tip: The corn tends to come off in sheets, so I use a pastry cutter to help break up the kernels. Just be careful not to mash the corn. Add the remaining ingredients (avocados last) and mix well. 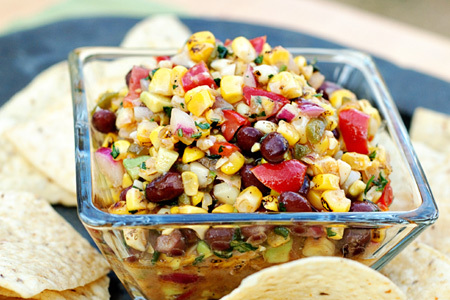 Tip: This salsa is great warmed and served over grilled fish or on fish tacos. John, this is making me so hungry! I love salsa and adding the grilled component just kicks it up a notch!! Excellent recipe, John. I've been making something similar this summer but without the black beans and the seasonings a little different. The kids love it so I'll have to give your version a shot. Certainly not the most traditional salsa I've ever seen, but definitely delicious looking. Most of the salsa recipes I use are primarily tomato based with seasoning and a few added ingredients for garnish. Now I'm starting to wonder if I'm just being lazy. Sounds awesome! I'll have to check this recipe out - - I have one that I make all the time, but it doesn't include the black beans or avocado.